First issue of 2014! ENSPIRE Magazine discusses bullying, the music industry, the coming of age expressed using artistic expression, a dose of truth, beauty and fashion. 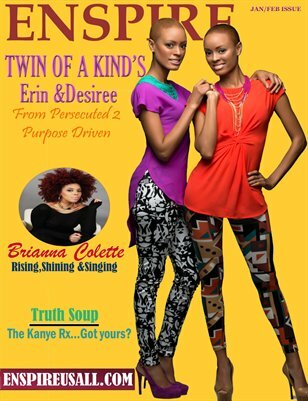 Join the movement and take a look into the lives of Erin and Desiree of Twin of A Kind, Singer -Brianna Colette, Fashion Designer - Haneefah M, International Model - Kenya Thomas, Actress and Writer- Latonia Phipps, and much much more!